From the formation of the Air Cadet Corps on 15 Nov 1940 until 1943, officers of Air Cadet Squadrons were not commissioned but held an Air Cadet League warrant. Officers and adult First Class Warrant Officers wore the RCAF Officer Uniform with Air Cadet Cap Badges, Collars, Buttons, Squadron shoulder flashes and shortened rank that did not go all the way around the sleeve. They could also wear medal ribbons and aircrew wings. On 22 April 1943 the Governor General-in-Council authorized a further component of the RCAF known as the “Air Cadet Corps” in which qualified persons could be appointed to commissions and shall not be deemed to be on active service. Commissioning and training courses started in earnest in the summer of 1943. They wore the RCAF officer dress uniform and cap badge, which in most cases would have been a private purchase from a tailor as that was the norm for officers at the time. Left – Officers of No.1 Westmount Squadron, Montreal, 1942. A badge, similar in colour and design to the present officers’ type “Canada” badge, bearing the initials “A.C.C.” has been authorized for wear by R.C.A.F. Air Cadet Corps officers. These badges must be worn at all times in accordance with dress regulations, on both sleeves of the jacket and greatcoat, the top of the “ground” being one-half inch below the shoulder seam. Badges may be obtained by officer personnel on prepayment, at a cost of three cents per pair. Air Cadet squadrons are to submit demands by letter to C.H.Q., along with a cheque to cover the cost. When approval has been given, these demands are to be passed to the appropriate equipment depot to supply direct to the air cadet squadrons. Top – Pattern 1 has thinner, more rounded, slightly larger letters and a fine black backing material. Bottom – Pattern 2 has thicker, less rounded, slightly smaller letters and a coarse white mesh backing material. AFRO 2472/43 is hereby cancelled and the following substituted. 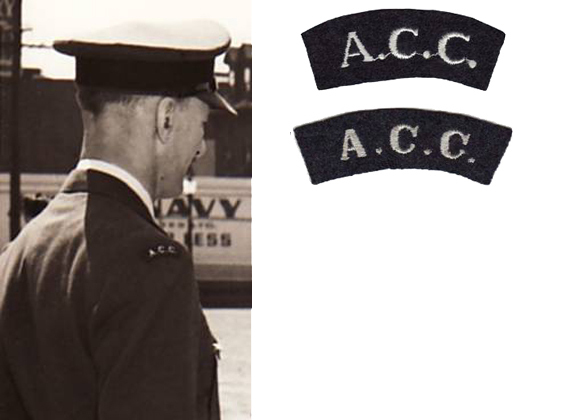 Badges, arm, distinguishing, “ACC”, similar in colour and design to the present officers’ type “Canada” badges, are authorized for wear by officers of the R.C.A.F. (Air Cadets). It is not known if this is just a name change from RCAF Air Cadet Corps to RCAF (Air Cadets) or if the badge also changed from A.C.C. to ACC without the periods as no badge like that has been seen. AFRO 2122/44 is hereby cancelled and the following substituted. Badges, arm, distinguishing, “Air Cadets”, similar in colour and design to the present officers’ type “Canada” badges, are authorized for wear by officers of the R.C.A.F. (Air Cadets). The following photo of an officer wearing the AIR CADETS flash is in a No. 386 Sqn photo album from a picture taken at the April 1948 Annual Inspection. 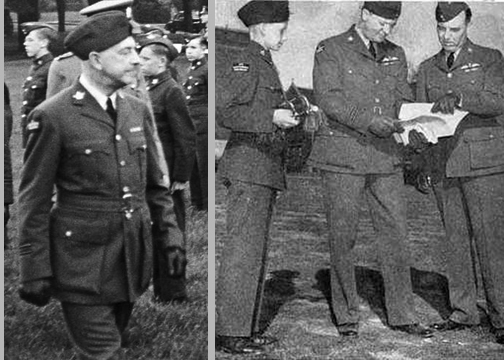 In other photographs from the 1947-48 year the officers appear to be wearing the AIR CADETS flash but the pictures are not clear enough to be certain. Pictures from the following year show the officers wearing the RCAF CANADA flash or nothing. This badge is similar in shape & make to A.C.C. Pattern 2 and has a coarse white mesh backing material. While it fits the description of the 1945 badge, this picture (below) of cadets from No.185 Olds Sqn wearing this same style badge in 1955 appeared in the 1956 Air Cadet Annual. So the above badge could have also been a proposed air cadet shoulder badge before the introduction of the standardized Air Cadet CANADA flash. This badge is one of a pair worn with the eagle facing backwards. It has a fine black backing material. As no information on this badge is known and as no pictures have at this point come to light it is thought that this badge is possibly a proposed prototype or trial badge. Its similarity to the following badges seems to lend credence to that theory. No official information on these badges is known and as the only pictures at this time are from the 1947 time period it is thought that this badge is possibly a trial badge. Photo evidence shows that it was never in general use or favour and was definitely replaced by April 1948. F/O E.A. 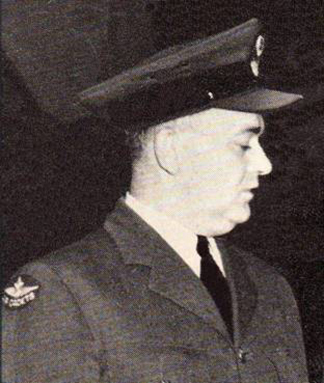 Anderson, CO of No.211 Ottawa Kiwanis Sqn, wearing the 1947 distinguishing badges at his squadron’s annual inspection. The picture is from the cover of the Canadian Air Cadet September 1947 issue. 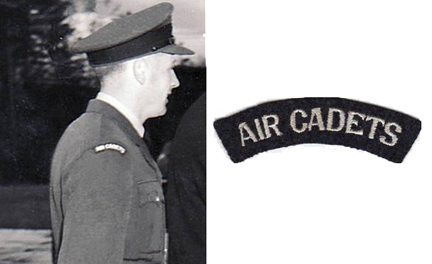 The present cloth shoulder badge worn by officers of the RCAF (Air Cadets) has been replaced by a collar badge. This is a small gilt metal badge in the form of an eagle surmounted with a maple leaf and inscribed with the letters “R.C.A.C.” underneath. The badge is to be worn on both collars. The bottom of the badge is to be one inch above the step opening of the collar; the vertical axis of the badge is to be parallel to the inside (rolled) edge and midway between that edge and the outside edge of the collar. The existence of this metal collar badge is unknown at this time, as are details such as size or if they came in a left & right pair. From then on RCAF Officers working with Air Cadet Program wore the same uniform as regular RCAF Officers with just the standard CANADA distinguishing badges. If anyone has any more information or pictures on these or other badges worn by the RCAF Officers of the Air Cadet Corps please contact me at kwright5@shaw.ca.